With Mediterranean origins, the artichoke was praised for its medicinal and health properties as long ago as the ancient Greeks and Romans. Artichoke buds are on our Superfoods list because of the high presence of dietary fibre and anti-oxidants that help reduce bad cholesterol and prevent the absorption of toxins, working as a nutritionally rich detox source. Other big nutritional ticks come from the fact that they’re only about 47 calories per 100g, a good source of folic acid and provide 20% of the daily recommended vitamin C intake. As well as vitamin C, artichokes are also rich in vitamin K and in minerals including calcium, copper, iron, manganese, magnesium and phosphorus. What that means for the body is that artichokes promote brain function, bone health and cellular metabolic functions. As far as anti-oxidants go, these green buds are the very top of our list, preventing aging and keeping the skin looking fresh and young. Although there are many elaborate recipes for artichokes, you can collect all these health benefits by preparing them in a very simple way. The triangle-shaped ‘scales’ that give artichokes their characteristic look are actually protecting the bud but they carry the edible portions, tucked away closer to the center or ‘heart’. Chop off the top and pull back the tough outer leaves until you begin to expose the tender ones, rubbing all cut surfaces with lemon juice as you go, to prevent oxidation. Discard the fibrous ‘choke’ in the centre. Pop into a few centimetres of boiling water, add a little salt and lemon juice, cover and cook until tender. Enjoy each scale, dipping it in your favorite sauce, such as mayonnaise or melted lemon butter. To try in a delicious dip by Stacey from goodnessis.com just follow the recipe and enjoy! 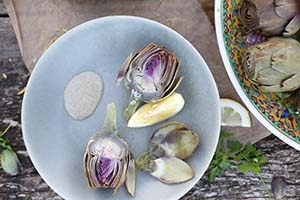 Globe artichokes, with their sharp, sometimes prickly edged 'petals' are actually the plant's flower buds and will open up into showy mauve thistle heads. When picked young as in this recipe, their heads are small and tight, they can be eaten in their entirety. The real treasure - lies hidden. This is found by removing all the petals and 'furry 'choke within, revealing the grey-green tender heart. When buying artichokes, choose those in which the petals are still rather closed, not open. They will be more fresh and tender. Buying in season and buying fresh you will benefit more times over from their amazing health benefits. Not only being full of fiber, they also have the highest level of antioxidants out of all vegetables, a good source of Vitamin C, magnesium, potassium, folate and iron. They are also very good for the liver and were used for centuries as a traditional liver tonic. In a large heavy bottomed pot on medium heat, add enough water to cover the artichokes, add a bay leaf and a slice of lemon. (This adds a nice flavour to the artichokes.) Leave to heat while you prepare the artichokes. If using large globes, cut the thorn tips of all the leaves using a pair of scissors - not necessary when using smaller globes. Pull off any smaller leaves towards the base and on the stem. Trim off the bottom, leaving about an inch on the artichoke stem. The stem is bitterer than the rest of the artichoke, edible if you remove the tough outer layer using a vegetable peeler. Cut off one centimeter off the tip of each artichoke. Rinse the artichokes in cold water. Open up the petals a little so that the water does get inside more easily. Add the artichokes to the boiling water. Cover, and simmer for 20 to 30 minutes, (depending on the size of the artichokes) or until the outer leaves can easily be pulled off and a knife tip goes easily into the base of the artichoke. Artichokes can be eaten cold or hot. Serve them with your favourite sauces, melted ghee, mayonnaise, a simple mix of olive oil, salt & lemon or a sesame dipping sauce - like the one below. I usually choose a few to satisfy each member of the family. In a high-speed blender, add the sesame seeds and grind until they are roughly ground. Add the tahini, vinegar, tamari, oil and water, and blend until well mixed. Depending on the preferred thickness of the tahini, you may need to add more water. I like the consistency quite thick. I tend to double the recipe and use leftovers as a salad dressing or served with brown rice and sautéed vegetables. Pull off the outer petals, one at a time, starting at the base and dip in the sauce, then bite off the soft part found at the base off each leaf. Discard and compost the tough leaves in a pile as you go. When all the leaves have been enjoyed, you will come to the choke, with a spoon scrape out and discard the fuzzy part covering the artichoke heart, the remaining is the heart. The treasure! Savour, dip and enjoy the journey.